This is my own 'concoction' recipe. Came up with it a few weeks ago and discovered that I wrote it down in my journal! Of all things! Well, I decided today to make it again AND to share the recipe with you cuz its really good! 1 Large container chicken broth (160z) -although a 14oz can will do fine too. 1 Can diced tomatoes- do not drain. 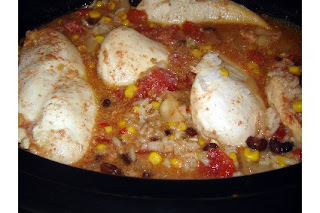 -In crockpot mix all ingredients except the rice and chicken. 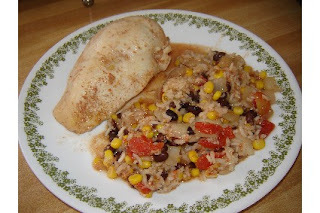 -If you have a large oblong crockpot lay the frozen chicken on top of the mixture. If you have a deep crockpot, wedge the chicken into the mixture so that each piece is in the liquid. -Cook on High for 3-1/2 to 4 hours, put rice into crockpot one hour before its done. If you like your rice very mushy and porridge-like, add the rice right away with the rest of the ingredients. We've had it both ways and its very good. -Serve with tortilla chips and cheese and sour cream! **This recipe would also be great with leftovers and minute rice on the stovetop!